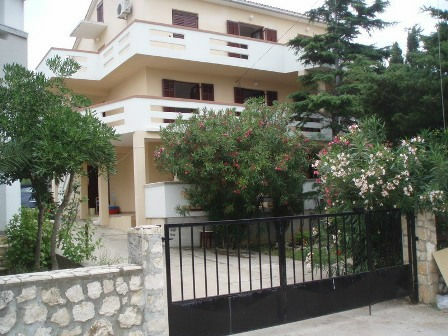 The house is located in a quiet part of Novalja and is ideal for a holiday after a "crazy" night, afternoon fun on the beach or on water sports, 350m from the nearest beach, 300m from the center and 500m from the health center. Parking is secured in front of the house. The apartments are ***, measuring 40 and 60 m2 and located on the ground floor and the second floor of the house. Ideal for families with children or friends (registered 2+2 and 4+2), they have large terraces overlooking the sea and trees. Apartments have ceiling ventilators and are located in a green area that provides a pleasant shade. Price on request.